Egypt is a country that is filled with thousands of years of culture and its capital Cairo is a chaotic city that preserves the ancient element but it is also the center of modern culture in Africa. 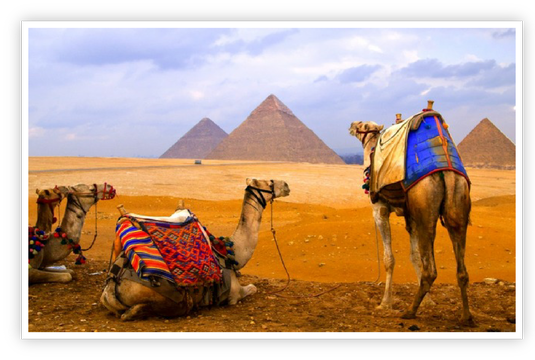 Cairo is located near the Sphinx and Giza, where the pyramids of Egypt are situated. Inside the city there are Christian churches, Moslem shrines, magnificent temples as well as the well known Egyptian Museum of Antiquities where immense treasures are being exhibited. In the beginning the noise of the city surprises the visitors but Cairo is a dynamic city that almost never sleeps. The night life in Cairo is intense and as thrilling as the enchanting treasures that are found everywhere in the city. If you wish you to wander in the Al Khalili Market, become enchanted by the thousands of years’ Egyptian history, visit the monuments of the city and get to know the modern city all you have to do is book now a cheap flight and travel to Cairo. All the above airlines are landed at the International Airport of Cairo (more information below). When making plans for a holiday trip to Cairo it is better to make a reservation as soon as possible in order to find cheaper air tickets. Many airlines promote cheap flights and announce special air ticket offers for reservations made 1 or 2 months prior the departure. The international Airport of Cairo is located 15 kilometres outside the center of the city. It is a busy airport with 3 terminals as well as many comforts and services for the travellers. In the airport there are various restaurants and cafeterias that operate 24-hours a day, as well as shops, bookstores, duty free shops, storage areas for baggage, a bank, ATM machines, a pharmacy, an exchange office, post offices, travel agencies and of course ticket desks for flight reservations. The transfer between the terminals of the airport is done via free buses because the terminals have a 3 kilometres distance from each other. In order to transfer from the airport to the center of Cairo you can use the public buses that have regular schedules. Bus 400 departs from the airport (terminal 1) to the center of the city every half an hour during the day and every 1 hour during the night. The ticket costs 0.25 LE. Buses 27 and 949 have a direction towards the center of Cairo and their ticket costs 0.50 LE. Buses 970, 971, 948 and 925 have again the same direction and their ticket costs 0.25 LE. Buses 356 and 799 have air-conditioning and so their ticket costs 2 LE. The buses stop in central points of the city such as Tahrir square, the center of the city, Mohandesin, but also have a directed towards the Pyramids in Giza. The journey from the airport to the center of the city can last up to 1 hour if there is traffic, not an unusual phenomenon in Cairo. The official taxis of the city are black and white and there are innumerable available taxis outside the airport. If you choose a taxi for your transfer to the center of the city feel free to negotiate the price before you board the vehicle.